The checkered beetle genera Acanthocollum Opitz and Stegnoclava Opitz are redescribed and the genus Ichnea Laporte is revised for the first time. The monotypic genus Acanthocollum contains A. melanurum (Klug). Stegnoclava includes one previously described species, S. fumigata (Gorham), and two species describe herein, S. velatis Opitz, new species, and S. zorropsis Opitz, new species. Ichnea is comprised of 14 previously described species and five new species. 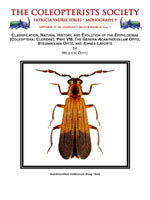 The previously described species are I. aequinoctialis Spinola, I. aterrima (Klug), I. digna Wolcott, I. dimidiatipennis Spinola, I. divisa (Chevrolat), I. frenata (Erichson), I. incerta Gorham, I. lycoides Laporte, I. marginella (Klug), I. mimica Gorham, I. opaca (Klug), I. plumbea Gorham, I. praeusta (Klug), and I. procera Schenkling. The species of Ichnea described herein are I. acanthomelina Opitz, new species, I. atra Opitz, new species, I. callanga Opitz, new species, I. gregata Opitz, new species, and I. gremia Opitz, new species. Seventeen new synonymies are designated: I. aequinoctialis (= I. funesta Gorham, I. histrica Gorham, I. spinolai Corporaal); I. aterrima (= I. mexicana Thomson, I. religiosa Chevrolat, I. vitticollis Kuwert, I. kuwerti Lohde, I. elongata Knull); I. frenata (= I. disjuncta Gorham, I. panamensis Gorham, I. subfasciata Gorham, I. mitella Gorham, I. striaticollis Kuwert, I. confluens Kuwert); I. marginella (Klug) (= Enoplium laterale Klug, Hylecoetus cylindricus Germar); I. plumbea Gorham (= I. helvolicollis Corporaal). The species of Acanthocollum characterized by having a ridge of golden yellow setae on the upper sides of the pronotum. Species of Stegnoclava have the antennal funicle extensively compacted, and in species of Ichnea the distal margin of the pygidium shows a distinct triangular, depigmented mark. Like other epiphloeines, species of Acanthocollum, Stegnoclava, and Ichnea are thought to be predators of lignicolous insects and highly involved in Batesian polymorphism. Two major lines of evolution are apparent within Ichnea, one having evolved toward a lycid type of body form, whereas the other progressed towards a lampyroid configuration. Twenty-one characters were evaluated phylogenetically and analyzed with WINCLADA, in coordination with NONA, to generate a nearly completely resolved species-group level phylogeny. It is postulated that the progenitor of the three genera evolved in South America, with subsequent ancestral stocks extending into Central America following the closure of the Panamanian portal.